Filled with either lean ground turkey or beef, these Stuffed Cabbage Rolls are served with a tomato sauce and are sure to impress a dinner crowd. This simple weeknight meal is popular in Eastern Europe, the Mediterranean, and parts of Asia. This classic comfort food is a hit every time! Hi Everyone, Here we are at the end of April and I don’t know about you but I can’t wait for Summer to get here because it is has been a very cold Spring! I heard we do have some warm weather coming up so I’m pumped for that! 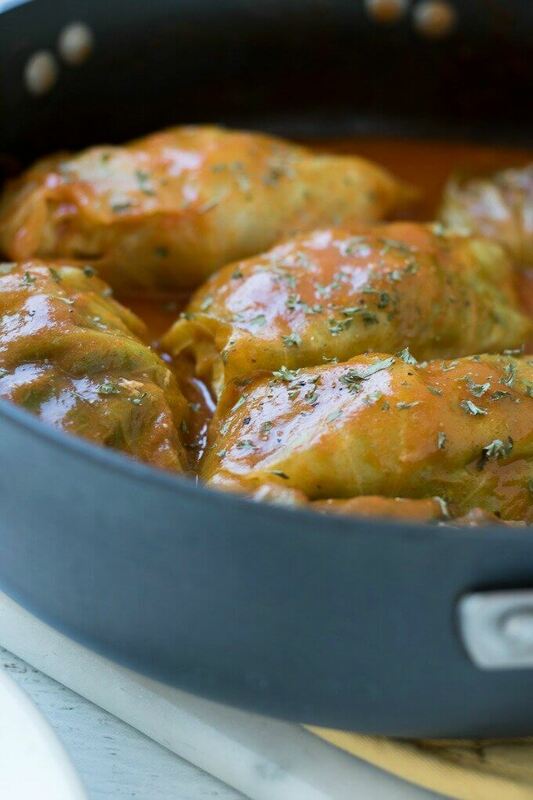 I recently had the pleasure of developing this recipe, a VERY easy, Americanized version of Stuffed Cabbage Rolls and I my gosh, they are so good, tender and savory. They are also easier than you would think to make! The recipe has the busy, home cook (ahem, like myself) in mind, using simple ingredients like just 8 cabbage leaves, turkey or beef, onions and condensed tomato soup, I am not going to reveal anymore, just check out the recipe on SoFabFood! Have you tried Stuffed Cabbage Rolls? Let me know in the comments below!